Russian blogger Marat Burkhard told Radio Free Europe that working in an infamous "troll factory" generating fake internet posts and comments was "Orwellian." "Whatever we're told, that's what we'll write about, no questions asked, and we don't want to know." Using the word "absurd" no less than five times, he detailed how a typical day went at "Internet Research," a company run by a Vladimir Putin crony. The team of around 300 employees reportedly puts out about 30,000 pro-Kremlin comments a day from fake accounts on Twitter, Facebook and websites like the New York Times. Burkhard took the job because it was an "adventure" and pays considerably more than a professional journalist makes in the nation. Burkhard said the he worked with two other trolls, with one the "villain" who criticizes Russian authorities, and the other two defending the government. The team would create fake comments on Russian news posts (often written by other trolls at Internet Research). The exact text didn't matter, but they were required to stuff comments with keywords like "defense minister" and "Russian army" to improve a post's search rankings. One individual was tasked with adding "demotivators," or troll-style pictures that undermine the villain's points, while the other would post links and counter-arguments. A typical assignment would be to comment on an article like this, which claims that western soldiers are embedded into a troop of Ukrainian "neo-fascists." First, the villain complains that "Russia as usual blames Ukraine for the things it's doing itself" to set up the faux debate. A second troll then links to a similar report and says "you should know how much evidence has already been provided that... the West and (Ukrainian President) Poroshenko are reluctant to pursue peace." 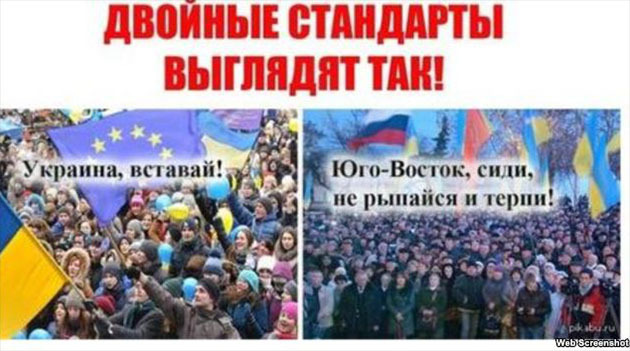 Then, the picture troll drops in a demotivator (above) implying that a Ukrainian region is pro-Russian. On top of spamming local journals and social media, the operation also targets western sites like CNN and the BBC and even has "special people working on Facebook," according to Burkhard. Employees in those department reportedly make even more money, even though most are "barely capable of formulating what's important about these stories." He said he eventually quit "because I can't engage in absurd work," adding employees are "constantly under threat of being fired." Despite the absurdity, however, he added that the trolling worked: "everyone kind of believes in this truth... it's Orwell." You can read the entire interview here.